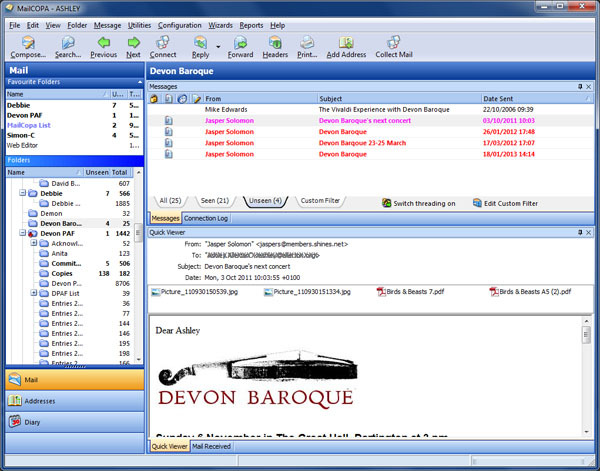 A range of viewing possibilities are available, all managed in this Main Window. NOTE that the window configuration is stored locally and will not be available if the same MailCOPA User logs in from another computer, nor if a different Windows User is used on the local machine (it is stored in the Registry). 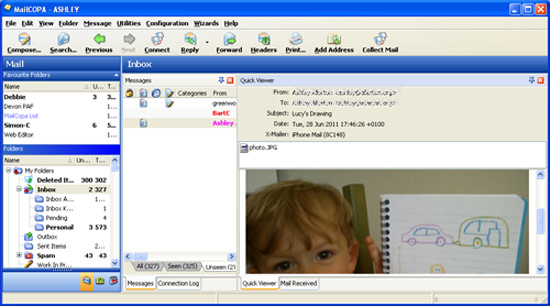 The Messages Window and Connection Log are tabbed together, and the Quick Viewer and Mail Received Window are also tabbed together. Clicking on a windows tab brings it to the front. If things get into a mess, DON'T PANIC! - you can reset the default view from View Windows Restore Default Layout and start again. Switches to Docking Mode - all of the windows on this tab will slide out of view, just their tabs being visible. Clicking on one of these tabs causes that window to slide back into place so it can be viewed. When the mouse pointer is moved off the window, it will slide back out of view again. Switches from Docking to Normal Mode. The tabbed sets of windows will always be visible.